As any of her cult followers will attest, Julie Rice, co-founder and co-CEO of SoulCycle, is obsessed with happiness through spinning. But a little-known fact: She’s almost as passionate about sweets. Rice cops to having a dietary duality: lots of vegetables paired with “a ton” of sugar. “My whole life is about snacking,” the 42-year-old mother of two tells Grub Street. 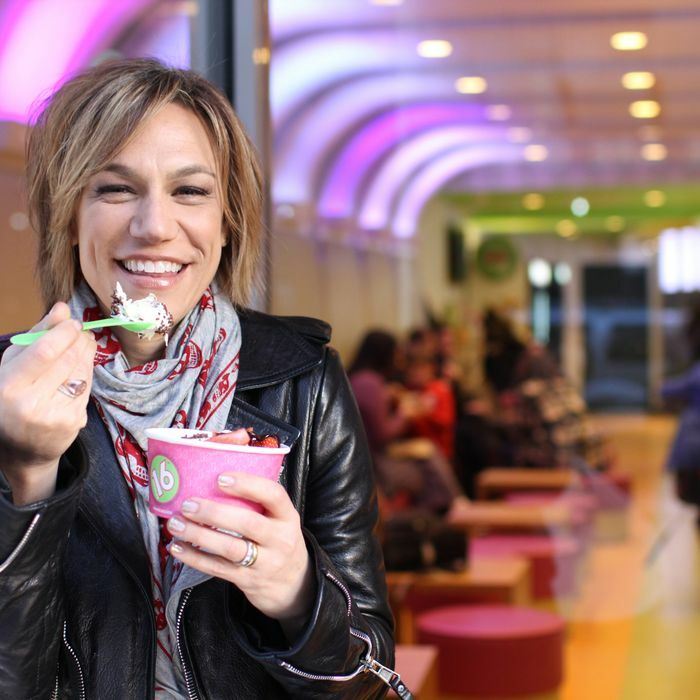 “My husband says if I were a superhero, my name would be the Nibbler.” Read all about her chocolate-drizzled Pop Chips, concession stand candy, and incredible quantity of frozen yogurt in this week’s New York Diet. Three weeks before my 41st birthday, I snuck in another baby; now, besides my 7-year-old, Phoebe, I have a 19-month old, Parker. So, naturally, coffee starts between 5 a.m. and 6 a.m. It’s always the same: coffee from Porto Rico or Ninth Street Espresso, with Sweet ‘n Low and almond milk. Parker says “button” and presses start. Banana before my 8:30 spin. I try to ride five mornings a week. When my partner, Elizabeth, and I rented our first space six years ago, we thought if we could get 75 people a day to ride, it would be unbelievable; now there’s thousands of people each day, East and West Coast. We’re so in it, it’s hard to step back and see what we’ve created. But when I do, it’s powerful. Anyway, after I ride, it’s lucky if I make it into the shower. At the office, I have an oatmeal package combined with Fage yogurt and berries. It’s delicious. The yogurt makes the oatmeal so creamy. Then I snacked on chocolate-drizzled Pop Chips and a golden delicious apple. Lunch was at an Allure shoot, craft services. I had a big salad with hummus, cut-up veggies, and water. Snacked on a dark-chocolate bar and a box of ginger snaps in the car on the way to a yoga retreat for the night with my husband. Car rides are best for sugar. It’s like it doesn’t count. I’m not embarrassed to say it. We were going to a “communication workshop” called Getting the Love You Want. It’s just a day in the Berkshires learning how to listen. We’re not the touchy-feeliest people, so it’s really good for us. Dinner was at the Kripalu Center: spinach and bleu cheese salad with tuna, and butternut-squash soup. It’s so crunchy there. It’s like, Would you like some kale with that kale? Breakfast was an egg-white-and-mushroom omelette at our wonderful inn at Stonover Farms. If you love the Berkshires, that’s the place to go. Then one more hippy meal at Kripalu: a big green salad with shredded chicken, and a bowl of warm ratatouille. On the drive home, I snacked on Twizzlers, Diet Coke, and Good ‘n Plenty’s in the car. That’s the best combo ever, especially when bought at a gas station. We met friends for dinner at Red Rooster. I loved it there! Ordered a green salad and a smoked-salmon entrée but tasted everything my friends had. It felt so chic and so cool there; I loved the whole experience. Same morning routine: 7 a.m. coffee with Parker pressing the button; banana before SoulCycle class; oatmeal with Fage yogurt and berries after class. Took Phoebe to see Bring It On on Broadway. I purposely didn’t eat lunch so that I could have — my favorite — concession stand candy at a theater matinee! It was a combination of my greatest joys: musical theater with candy surrounding me. And my daughter! I got Junior Mints, Twizzlers, and pretzels. We are a Sunday night Chinese-food family, so I ordered in from Shun Lee. I had steamed chicken and broccoli, sautéed string beans, and hot and sour soup. You just can’t beat it. Had a Skinny Cow Mint ice-cream sandwich in front of the computer while buying Hanukkah gifts from Crew Cuts. Ate lunch with my partner, Elizabeth, at ABC Kitchen. I had roasted turnips and celery root to start and seared arctic char for an entrée. We love it there. On the way back to the office, I got 40 Carrots. Heaven! I always get a large plain yogurt with triple-extra melba sauce. No amount of melba sauce is enough for me. Dinner was a green salad from Chirping Chicken with baked sweet potato mushed in. I don’t cook at all. My husband is an awesome cook. Our kids call him Chef-Daddy. It makes him crazy that all I do is order in! Lunch from Energy Kitchen: turkey meatloaf and broccoli. Snack: York Peppermint Patty. Met my girlfriend for our monthly dinner at Next Door Nobu. I had yellowtail and jalapeño sashimi, tuna sahimi salad, and mushrooms. We caught up on kids and life. Ate a “damage-proof” Traders Joe’s 100-calorie dark-chocolate bar before bed. Lunch was 16 Handles — an event I could make an entire day out of — a mix of cookies and cream and graham cracker with an entire cup of toppings including chocolate sprinkles and fresh fruit. It’s the kind of lunch where you just want people out of your office; you can’t waste the moment! I really want to buy a 16 Handles. My husband cooked us dinner. Asparagus, roasted cauliflower, and he actually grilled fish for me on the barbecue, even though it’s freezing out. We put the kids down, talked, and ate. It was so nice.